With another year well under way, a lot of us are likely doing one of two things. Either creating a new website, or improving our current site/s. No matter which path you're following, there will almost certainly be a CTA button — Call To Action — or two in the mix. The mighty CTA is often the linchpin between a conversion and a flake. It's arguably more important than any other content, as it's positioned right at the junction of success and failure for your site. In order to make sure you are getting the most out of your buttons you need to know the do's and don'ts of a CTA. Here's a checklist to help you avoid the absolute ‘showstopper’ mistakes. Sure it might seem silly to have this on the list but you'd be surprised to know that some sites forget about the power of a CTA. Did you know a study back in 2013 showed that 70% of small business B2B sites didn't have a clear CTA? 70%! The number itself is mind blowing considering that most businesses are in the business of conversion. Remember that the CTA gets people going and while you should never think your site visitors aren't "go getters", a little prompting never hurts. Now when I say "make them clickable" I'm talking about your use of language as opposed to the mechanics of making sure that they are properly coded and linked. Yes, those are important but it doesn't really matter if your button doesn't do it's job, you know the one that prompts people to actually click your buttons. Prompting with creative and motivating language lets people know that you mean business. Getting rid of mundane and lackluster words like "SUBMIT" and "DOWNLOAD" generates better appeal and interest. Can you stand 20 feet away from your computer monitor and see your CTA as bright as day? If yes then your button is way too big. Sure you want the visitor to easily detect the button but using too large of a button can do a few things. It can come across as overly-aggressive, it can give your overall layout a messy look and it can have people overlooking the rest of your content simply because they can't get past the CTA size. There have been enough case studies over the last few years that have pretty much established that people base their opinions and reactions to things and people on appearance. This alone is a reason to make sure that you have "pretty" CTAs. Using stand out colors and creating contrasts within hues and shapes can help draw in the eye as well as get people to start clicking and reading. Using consistency to match the website is also a big help. Throwing your belongings around your house is a sure way to lose your things. This is why we create places for these things to go and the same goes for the CTA. Just placing your CTA anywhere on your page will undoubtedly affect reception and detection which are two things you don't want to lose out on. If you have to search for the CTA then it is obviously in the wrong area. Establishing connection using your CTA means that the button is in a position where it will align with the interest of the site visitor. This will mean that the button's prompt matches or is related to the nearby copy. Not only are you creating a guide without hammering the visitor over the head of where to go next or how to proceed but you are generating a better probability that the button will be clicked. While shoving button after button in people's faces is not the way to go, you don't want to miss out on placing a valuable CTA in an area that it needs to be. Remember that a CTA isn't just a button to get someone to download or buy a resource. It's an element that people can use to contact you , learn more or create something out of necessity. Finding middle ground of how many to use especially on one page is something that can be determined via testing and surveys. Vague language or cliche language is unflattering and uncreative. You must remember that you are targeting real human beings and while you cannot personalize your site for each and every person who visits, you can opt for a close alternative. Take your language from standard "Make Your Account" to "Make MY Account". Simple changes to more possessive words like "me" "my" and "mine" makes the visitor feel as if you are addressing them directly. While this does seem like another no-brainer there are several sites out there right now that have made this mistake. Having a CTA button is great but it won't do you any good if you forget to link the CTA to the correct page or input a broken link. Other than a broken or link-lacking button some CTAs strangely just send you back to the home page which creates frustration for the user. With mobile devices seemingly being the new way to get online you want to make sure that your CTAs are mobile friendly. You will want to make sure that what a desktop user will see is the same thing that someone on their phone or tablet will see. The experience should be as identical as you can make it in order to capture mobile users. Your CTA should be like a snake. It should strike fast and bite hard to grab your visitors. Being too wordy can create impatient visitors that may very well just click the back button or overlook your button altogether. Not only this but using too many words and failing to get straight to the point can create confusion and once more a button not clicked on. Making sure that visitors know that your button is clickable is a very important. If they don't realize this then chances are they will not click. Using bevels and drop shadows elements can help with this. 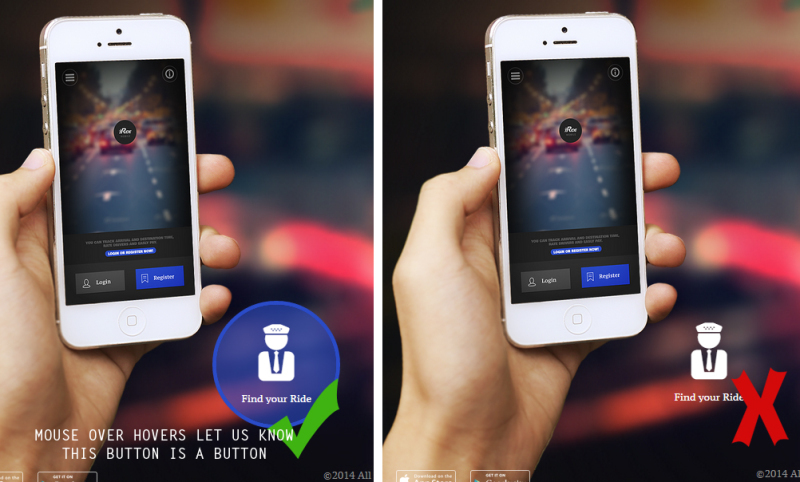 Adding animation like rollovers and a glow is another trick you can use to make people click. The time for flash animation has passed however as it won't work for those who are on devices or computers that don't have the capabilities to use flash. 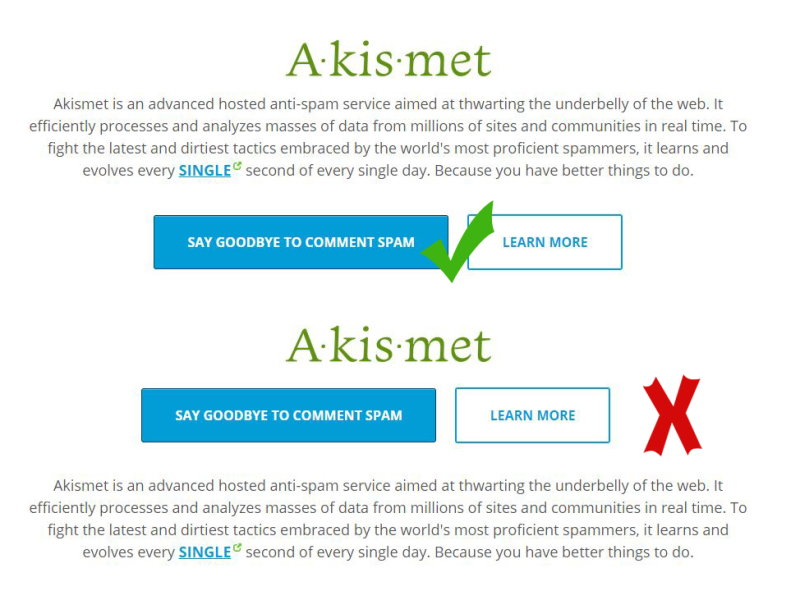 While there are people who will argue this, a red CTA can spell doom for your site. In other words people will turn away instead of clicking. The general consensus is that the color red means "bad" and therefore a red button is not meant to be clicked on. If you must have a red button go for a lighter or darker shade of red and use gradients to create a soft and inviting look. Just as you don't want too small or too big of a CTA button, you want to make sure that your font is just right. Visitors should be able to read the text of your button quickly and easily. This may be fixed by choosing a simple type and at a good size. Remember the words need to stand out and catch everyone's eye. Now that you have an idea of what you should and should not do in regards to with your CTA buttons I think you are on your way to creating a better and more successful button. Make sure that you check out my tips on making your buttons overall more clickable. Keep in mind that while these principles are a great starting point, websites are complex beasts and small changes can ripple through in strange and unexpected ways. Test, test and test some more until you get something that works for you. I think the link in your Conclusion leads to somewhere unintended. Maybe slightly ironic considering the subject of this article haha. Love all of your articles though!